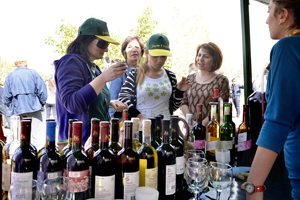 Supply Chain Financing "Rich Milk"
“Areni” wine festival took place at Vayots Dzor marz, Areni village on Ocrober 5, 2013. Attendees of the round table discussion were also invited to visit “Areni” Wine Festival on October 5th held in Vayots Dzor region, village Areni. FCA was one of the sponsors of the festival this year and was represented with its member-borrowers in a separate booth. Farm Credit Armenia’s member borrowers represented products of their field of activity during the festival. Rich assortment of homemade and factory produced wine was represented by the cooperative’s member-borrowers. “Vayq Group” LLC, “Maran” LLC and Sahak Khachatryan presented varieties of wine made from different kinds of fruits. However, the assortment was not only limited to varieties of wine, there were different kinds of dried fruits and cheese. “Golden Goat” CJSC was represented by about 8 kinds of cheese, however, the most famous one is the goat cheese. “Areni” wine festival is already a traditional celebration, where one can find representatives from all of the spheres of the society. The attendees to the festival had a chance to taste a selection of factory produced as well as homemade wine. Different traditional games, theatrical performances and other entertaining activities were organized during the festival. Villagers introduced their routine to those visitors interested in rural life. Farm Credit Armenia UCO CC is not responsible for the reliability and promptness of the content of Web sites mentioned here, for the advertisement placed on those Web sites, and any outcome of the usage of the information on those Web sites. In case of discrepancies between English and Armenian versions of the information Armenian version shall prevail. Cooperatives Europe is the voice of cooperative enterprises in Europe. On behalf of its 83 member organisations from 32 European countries across all business sectors it promotes the cooperative business model in Europe. The International Co-operative Alliance (ICA) is a non-governmental co-operative federation (a co-operative union) representing co-operatives and the co-operative movement worldwide. It was established in 1895.